Dragon Well Green Tea - Would You Pay 14,000 Dollars For A Handful? 14,000 Dollars For A Handful? 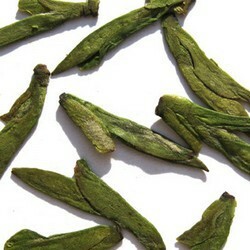 Why a Chinese man pays 14,000 dollars for just 200 grams of Dragon Well green tea. 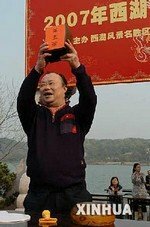 According to the Chinese state news agency Xinhua, a Chinese man recently pays 14,000 US dollars for just 200 grams of West Lake Dragon Well Tea. This tea, also known as Longjing or Lung Ching tea, is widely regarded as the Chinese National Tea, in a nation where tea drinking tradition stretches back at least 2,000 years. The auction takes place in the International Tea Expo Exhibition held in West Lake, or Xihu, in Zhejiang Province, China. West Lake is a renowned tourist attraction 180 kilometers away from Shanghai. The Longjing tea produced in West Lake is the most celebrated of all Chinese green tea. The best tea garden only harvests it once a year in early spring. The earlier the harvest, the higher the quality. Traditionally, this is the time of the year when the highest grade green tea is harvested and sold. 10 Longjing experts show off their roasting skills in the special occasion. According to Mr Ge Songde, they are the kings of this special roasting technique. After the tea is picked, it is processed in the same day by roasting in a wok. It is done entirely by hands in a hot wok using 10 distinct hand movements. 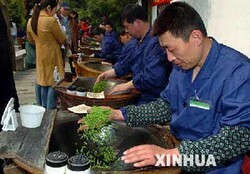 Aged between 35 to 59. the 10 experts were champions of the Longjing tea competitions since 1997. Making Longjing tea is a time consuming process. The 10 "kings" can only roast 500 grams of high grade tea in a single day. According to a local expert, one kilogram of the tea costs 5 Yuan in the 70s. Now, it costs 6,000 Yuan or 800 US dollars.